On what would have been Trayvon Martin's 18th birthday, lawyers for his accused killer George Zimmerman were denied a request to delay this summer's murder trial. 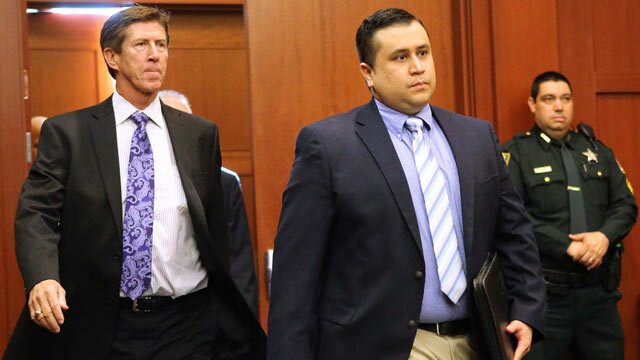 Zimmerman's attorney Mark O'Mara claimed during an often heated one-hour hearing that he needed more time to prepare, and that the state was not being cooperative with key evidence. "Its February and the trial's set for June," countered prosecutor Bernie de la Rionda. He argued that O'Mara did not deserve more time to prepare and that many of the delays were his own fault. The state has argued that the Zimmerman legal team is moving slowly because of a dwindling defense fund. Zimmerman's attorneys have acknowledged that the fund is just about empty. "The spirit of Trayvon Martin was definitely in the courtroom today on what would have been his 18th birthday. The judge ruled that the trial would not be delayed," Martin family attorney Benjamin Crump said today. Martin, 17, was shot and killed while walking home unarmed on Feb. 26, 2012, from a deli near his father's fiancee's house. Zimmerman, a neighborhood watch captain, has claimed the unarmed teen was acting suspicious and that he shot the teenager during a fight when the boy tried to get Zimmerman's gun. The case had inflamed emotions in Sanford, Fla., where it occurred and the trial is also expected to be emotional. A heavier Zimmerman looked on as Circuit Judge Debra Nelson noted that both sides had agreed earlier that they would be ready by June 10 when the trial is slated to start and that O'Mara's issues can be fixed in time. Besides the motion to delay the trial, most of the remaining proceedings centered around a teenage girl identified so far only as witness 8. Phone records show she was on the phone with Martin moments before the unarmed teen crossed paths with Zimmerman. Her testimony may prove crucial as a jury tries to determine who was the aggressor in the deadly altercation. O'Mara argued that the state is withholding information related to the teen's phone and how data on it was downloaded. The judge ordered the state to pass on all information concerning how the phone was tested and handled. Zimmerman's defense was also seeking to depose Crump later today. Crump was the first person to find and interview the teen, who says she told Martin to run after he complained about Zimmerman watching him as he walked to his father's girlfriends home on the night of his death. However, Crump's attorney argued that a deposition was improper because Crump was not a witness in the case, and that he had already filed a 15-page affidavit detailing how he found her and that should be enough. The judge asked for time to review the affidavit before determining if he would have to give a deposition. The summer trial start will leave both sides scurrying to finish depositions, scrub social media for more information into who the key players may have been, as well as plan for an all-important stand your ground hearing. Zimmerman's team will argue that he shot and killed Martin in self defense after the teen lashed out at him and pummeled his head on the ground. If the judge finds that there is enough evidence indicating that Zimmerman felt threatened than the entire case will be thrown out under Florida's stand your ground law. Outside of the Seminole County courthouse, about 20 supporters of Trayvon Martin gathered around a framed photo of the Miami teen with black balloons to sing, pray, and commemorate the 18th birthday. His parents did not attend today's hearing. O'Mara made note of the solemn occasion saying, "No matter what, a tragedy occurred." Remembrances are planned today throughout the town of Sanford, Miami where the teen grew up and throughout the country. In a possible sign of healing of the events planned, an anti-gun rally in a historically black Sanford neighborhood, is being sponsored by both the Sanford Police Department and the NAACP. The joining of both sides behind one common bond would have seemed almost unthinkable in the early spring of 2012 as thousands descended upon the city claiming that the Sanford PD was embroiled in a cover-up and alleging misconduct because Zimmerman had yet to be arrested.